Whether you’re storing your winter duvet for summer or your summer duvet for winter storing your duvet can be a pain. Well I’ve come up with 5 easy ways you can store your duvet, some are obvious, others less so, either way, I think you’ll find it useful. I read this on a forum somewhere and thought it was genius, put your duvet underneath the fitted sheet and use it as a mattress topper! If it’s a big squishy winter duvet this will add some real comfort and saves you having to take up a heap of cupboard space. Vacuum packed bags are a great choice for if you’re trying to save on storage because duvets are mostly air to trap in heat. They just need some extra time to air out and puff back up after they come out. That’s right, get it in a bin bag. Twist up the top and rubber band it to keep it sealed and chuck it up in the loft or into the top of an airing cupboard, even under the bed. Just anywhere that you can leave it happily without it getting in the way. And preferably tucked away out of site because you don’t want to look at a big unsightly bin bag all the time. Alternatively get it inside a plastic storage box. You might need to tape the thing shut if its clips aren’t strong enough but an easy way to store your duvet. And they slide under the bed really easily. This is one of the most ingenious ways of storing a duvet. Roll it up in a sheet and tie close the ends. That way you have a great big body pillow! You can keep in on the bed to make sitting they’re more comfortable or keep it in the bed and you’ve got something to spoon. 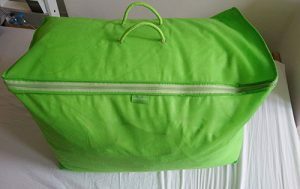 A bonus sixth option because you already need to own the bag, but some duvets come with a bag that you can use to store the duvet. Not much use if your duvet didn’t come with a bag but in case you’ve got one and had forgotten about it now’s your chance to dig it out.